For the past 11 years we have been on a journey to move towards being one church under the Word. There was a time when we had two distinct worship services, which caused us to function as two distinct churches. We have since made significant strides towards being one whole family by having identical services, but our journey to become one family is still UNFINISHED. Our church is divided between two services. We have never taken the Lord’s Supper together on a Sunday morning. Each half of our church sees only half of our baptisms. We have not been able to celebrate so many joyous things together. Jesus calls us to live in meaningful covenant community as we worship together, but sadly, we live at a distance from each other, separated by multiple services. At home, when our families celebrate Thanksgiving, we have one family meal. We have one community gathering on Friday nights for High School football, no matter the capacity. In comparison, our Worship Center prevents us from gathering in one service. In addition, our facilities are under-equipped to allow us to grow as our community grows. We must work toward the sort of unity and togetherness that honors Christ, positions FBC for greater Kingdom impact, and far outweighs the joys of a football game or a shared meal with family. We believe that we will be stronger together by moving from two worship services to one. In order to do that we will need to expand and renovate our Worship Center. This will also allow us to grow as our community grows, as well as address the needs of an outdated and under-equipped facility. Moving to one service is also a strategic opportunity to focus radically outwards for the Kingdom. We are rethinking how to reach people for Christ. Rather than building larger and bigger buildings every decade, our goal is to maximize our campus in order to become a more effective sending center for the Kingdom. We want to harness the strength of one service, coming together for Kingdom growth. By moving to one service we will free up many laborers as we together think through how we can plant new churches and revitalize declining churches. Our congregation is separated. Our campus is incomplete. Our two services require us to spend excessive man hours, resources, and energy that could be put to much better use. We believe that God is not finished with us yet. The next step in our corporate unity is to stand together in one worship service. We began a journey in 2007 by adopting a master plan for our campus. We have now reached the third and final part of the plan. Church planting is the most strategic way to grow the Body of Christ in East Texas and the world. Rethink church growth as we go about the work of the Kingdom by championing, revitalizing, and planting healthy, Word-driven churches. What is the specific plan? Expand our Worship Center for more seats so we can gather as one family and be prepared for future growth, increasing our capacity to 1,500 seats. Renovate the 2nd floor of the Education Center to maximize use for ministry. Build a 3rd floor (6,000 sq. ft.) on the Education Center to house more classrooms, giving us 4,300 more sq. ft. of education space. First and foremost, we are asking that you pray and ask God to make Christ and His Kingdom your first priority. Prepare your heart to be a joyful giver. Engage in personal reflection on your giving journey by using this Unfinished booklet. Talk with your spouse, your family, or others about what this commitment will mean for this next exciting season of your life. We are asking that you make a sacrificial commitment to gospel-motivated generosity. Finally, we ask that you prepare to be amazed. We serve an awesome God and we trust that He is able to move in huge ways. We anticipate an unprecedented impact from our collective Unfinished commitments – something only God can do. Please mark your calendar for Commitment Celebration Sunday, May 6, and pray for the Lord to demonstrate His mighty work in FBC Lindale. Why not tear down the current Worship Center and build new? As we explored this option, we discovered that initial costs started at $10MM for a totally new construction. A rebuild would also require us to spend an extraordinary amount of time without a Worship Center to gather in on Sunday mornings. In addition, our footprint in downtown Lindale is limited, and a new construction would only give a few additional seats in comparison to a renovation. Why not simply refurbish the Worship Center? Our goal is not simply beautification but to prepare ourselves for the future ministry and growth of the church. We certainly could repaint wood trim to make our Worship Center look nicer. We could get new carpet to brighten the room. We could remodel bathrooms and doorways to make things easier for handicapped individuals, but none of these things would address our lack of seating. In fact, if we were to begin the process of bringing our facility up to code, then that would require us to push further into the Worship Center, and would in the end actually reduce our number of seats. We are asking that everyone make a three-year commitment, which is 36 months. The fulfillment period for your commitment will begin with our First Fruits Sunday on May 20, 2018, and it will culminate in June 2021. Why should I fill out a Commitment Card? The whole of the Christian life is between God and the individual, but we involve each other in our growth and accountability. Giving is no different, and we want to emphasize our covenant community as we lock arms for this cause. Paul gave the Corinthian church an encouragement to give what they had resolved: “Each one must give as he has decided in his heart, not reluctantly or under compulsion, for God loves a cheerful giver” (2 Corinthians 9:7). Practically, these cards are significant to help us map out the timing of the Worship Center expansion. If you decide to give but do not fill out a card, then it will make construction planning difficult. Will I be able to change my commitment if I need to over the giving season? Yes, just keep our financial secretary informed. What about people who join the church after Commitment Sunday on May 6, 2018? We are confident that the Unfinished vision will continue to excite people over the next three years, and new members will have the opportunity to make their own commitments of generosity as they link arms with us..
Why invest in a building? There are only a couple places in Lindale big enough for all of us to fit under one roof. 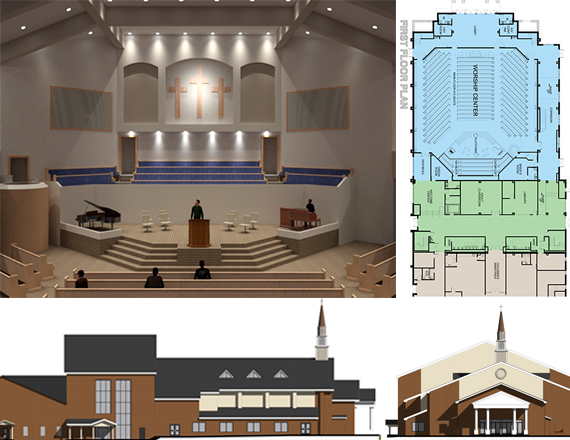 This expanded Worship Center will be practical and useful, and will outlast us. Our current Worship Center has served us well since 1974. It enabled us to grow as a church. However, we need to think about the next 50 years. There is nothing inherently spiritual about parking and seating – the value comes when we realize that each of these spaces and each of these seats represents room for a person to be connected to God and to First Baptist. Unfinished is all about maximizing our property’s potential so that First Baptist’s potential to reach this community will be realized in a greater way. If we expand our Worship Center, will we have enough parking? Yes, we will have enough parking. The national average for church parking is 2.5 people per car. At this ratio, the number of parking spots we have is enough to accommodate an expanded Worship Center at maximum capacity. Are there additional ways besides cash that I can give more toward Unfinished? Be creative as you explore ways you and your family can give toward Unfinished. You might have some stocks, property, or other items of that nature. Or you may have some stored resources that God has blessed you with in the past that He just might be calling you to give out of during this time. Please let us know if you need assistance with facilitating gifts of property or stock, and we would be happy to help you with that. You can contact our church office to make a gift of this type. What if I don’t have a job right now? What does that mean for my Unfinished commitment? Unfinished is about your total, radical, and sacrificial generosity to God’s mission at First Baptist. We believe that God calls us to action in times of hardship just as much as He does in times of abundance, and that looks different for every person. But Unfinished is about a heart change – one that is only accomplished by surrendering our lives completely over to God in this area of giving and declaring that we are a people who are Unfinished. So that may mean that you are being challenged to sell things, to pick up odd jobs, or even to trust God in faith as you seek for ways to sacrifice and work toward that commitment. We would like for 100% of us to be a part of Unfinished so that we can all be supporting, loving, encouraging, and praying for one another through this spiritually-stretching season at First Baptist. I like to give to many other ministries. Why should I expand more giving to FBC or now give primarily to FBC and this project? God’s plan for redemption is through the local church – and it’s a worthy place to invest. 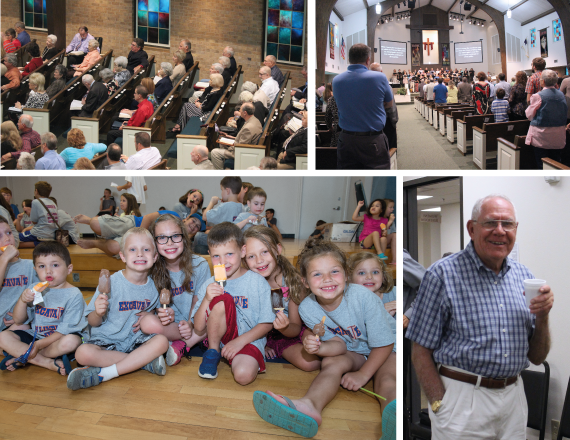 While partnering with other organizations can be wonderful, we have an invested interest in every way in the work at FBC. Rather than spread yourself thin over lots of things, we encourage you to do a few things well. What if I am severely in debt? What if I can’t afford to give right now? If you are someone currently seeking to make payments to pay off debt right now, we commend you for making progress on that. And you should continue to do so. We would be happy to help you in this journey and/or to recommend a budgeting class that might minister to you. Being in debt does not, however, make someone “excused” from giving. It should be our joy and privilege to give at all times. Pray and commit to reconsidering every year what you can give. Please contact us if you need assistance with this or if you would like to speak with a budgeting counselor, and we would be honored to help. If you have never given before, this is your chance to get in the game with a committed sacrifice. We really hope you will. How much is enough to give? God calls for equal sacrifices, not equal gifts. The amount will be different for everyone. This is an opportunity to be a part of something bigger than you. Invest in the future of a Word-driven church in a growing town, and ultimately, invest in gospel growth in East Texas. Unfinished is about the vision for our church and our personal discipleship in giving as followers of Jesus. We believe that the local church is the primary and most compelling mission to give toward, and we would really love for you to make FBC your home and join us in Unfinished. If you are ready for it, this is a perfect time for you to put a stake in the ground and make this your church. We need you on the team! How long will we be out of our Worship Center during construction? The majority of the construction can be done while we use the Worship Center without interruption. We will need to meet in our gym for about 4 months while the final parts of the build are completed. Will this interrupt other ministries? We will all need to be flexible during construction, but moving to one service will simplify our ministry schedules and free up the servants in our church. We will reinvest countless person-hours per year into more impactful mission.